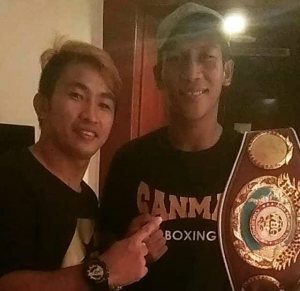 Sanman Boxing prospect Adam Diu Abdulhamid (W13 L6) captured the WBO Asia Pacific Youth Welterweight Belt by beating previously unbeaten Youli Dong (W12 L1) of China via 10 round Majority Decision. It was a big upset win on the road for the Filipino from General Santos City. “As you see , I have 6 losses in my record but that did not stop my from chasing my dream. I was waiting for the right time and it came right here in China. Dong is a good undefeated fighter but when the bell starts, records don’t matter, your determination does. I can’t believe I’m a champion now. Thank you Sanman Promotions for giving me this chance!”, Abdulhamid said. Sanman CEO JC Manangquil was ecstatic about his boxer’s win.